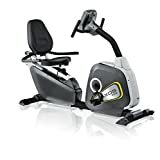 The sitting exercise bike variant of the AXOS exercise bike, featuring an especially comfortable and safe sitting position, enables optimal training for everyone. The handlebar and the open frame facilitates getting on and off. The training computer with push-n-turn offers convenient operation of the exercise bike. JTX Cyclo-5R Recumbent Exercise Bike. FREE Polar Heart Rate Chest Strap.